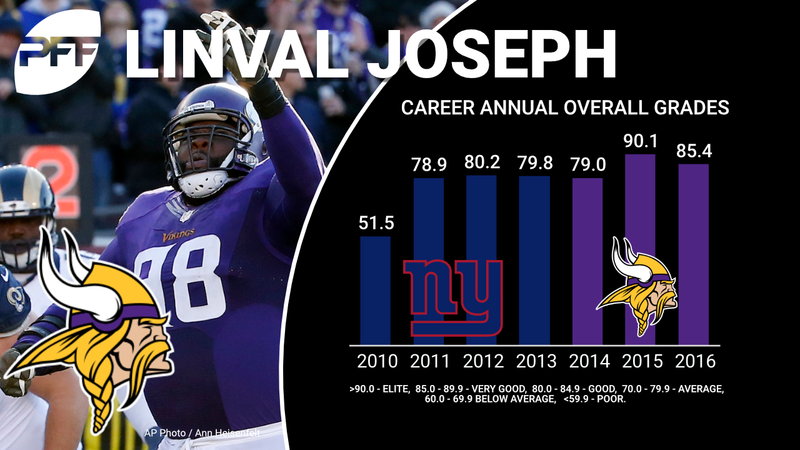 On Saturday, Minnesota Vikings NT Linval Joseph agreed to terms on a four-year contract extension worth $50 million with $31.5 million guaranteed. His 85.4 overall grade in 2016 ranked 14th among defensive interior players. Drafted by the New York Giants in 2010, Joseph has quietly been a consistent force – especially against the run – throughout his career. He joined Minnesota in 2014 and his top season came in 2015 (90.1 overall grade). Where Joseph has improved considerably is his pass-rushing over the past two seasons. In those two years, he’s collected 60 total pressures, an impressive number for a nose tackle where his main role is to stuff the run. 2015 showcased both dominance in run defense (90.3 run-defense grade – ranked fourth among DI) and pass rush (82.1 pass-rush grade – ranked 14th). Joseph’s 10.6 run-stop percentage in 2015 tied for sixth among NT/DTs.